LAS VEGAS, NV — Former MLB manager, Joe Torre, has been named the keynote speaker at this year’s Ticket Summit summer 2015 conference. The event is scheduled for July 15-17, 2015 at The Venetian Las Vegas. Ticket Summit is the leading conference and trade show for ticketing and live entertainment professionals. Source: Digital Journal. The event billed as, The keynote, A Conversation with Joe Torre, will be held Friday, July 17 at 12 PM. During the keynote, moderator Chris Maathuis of KLAS-TV will ask Torre to share highlights from his illustrious career, take attendees behind-the-scenes of Major League Baseball, and give his tips and tricks for success. Torre will also take questions from the audience. Immediately following the keynote, Torre will attend Ticket Summit’s Closing Cocktail Party, where he’ll take photos with attendees. Party attendees will also be entered into a raffle to receive either a baseball or a book signed by Torre. Joe Torre is the former manager of the New York Yankees, St. Louis Cardinals & Los Angeles Dodgers. Torre made his managerial debut with the New York Mets in May 1977. He later spent twelve seasons as the manager of the New York Yankees from 1996 to 2007, guiding them to six World Series appearances and four World Championships. He was named manager of the Los Angeles Dodgers on November 1, 2007. Torre is a sought after keynote speaker and has spoken for Fortune 500 companies across the country. Playing Field Promotions is a booking agent for motivational sports speakers and celebrities. 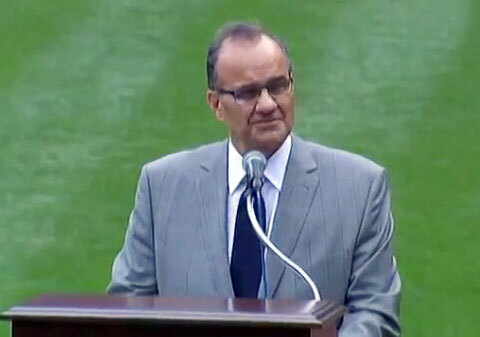 If you would like to book baseball speakers or MLB legends like Joe Torre for a speaking engagement, personal appearance or special event, you can request Joe Torre agent and speaker information from PFP Sports & Celebrity Talent or call 800.966.1380.